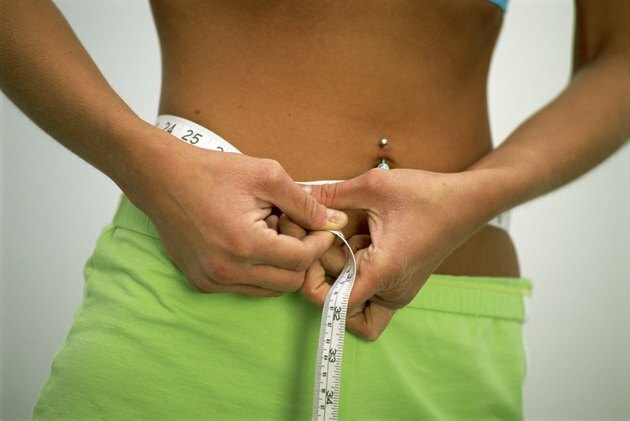 What Exercise Can Make Me Lose Three Inches Off My Waist? Losing weight off your waist requires more than a few dozen crunches. A combination of a healthy diet and the proper fitness regimen is the quickest and most efficient way to shed those extra inches. When it comes to exercise to whittle your waist, you need to choose exercises that keep your heart rate up and the calories burning. The key to losing weight in your waist is to lose weight in general, because spot reduction is impossible; an overall calorie deficit needs to be your ultimate goal. Cardiovascular exercise is any workout that raises your heart rate for a significant amount of time. Exercises such as jogging, cycling or swimming are all examples of cardio workouts. These types of workouts increase your heart rate, burning calories as well as melting away body fat. Perform cardio exercise six days a week for 50 minutes at moderate intensity or five days a week for 30 minutes at vigorous intensity to start whittling away at your waist. High intensity interval training skyrockets your heart rate, blasting away calories in a short amount of time. With HIIT training you are increasing the tempo of your exercise significantly for a short amount of time and then following it up with a longer period of time at a slower pace. For example, if you are on the treadmill, you would start at a steady jog for two minutes, then follow it with a one-minute sprint. You would repeat these intervals for typically 20 minutes before cooling down. Beginners can perform HIIT as well, just at a less vigorous pace. Instead of jogging and sprinting intervals, alternate between a moderate walking pace and a fast walk or slow jog. HIIT training is taxing on the body because of its intensity, so you should do it only a few days a week with at least 48 hours between sessions to allow your body to recover. Although strength training doesn't have the same calorie-burning effect that cardio exercise does, the benefit of strength training happens when you aren't even working out. Not only does weight training strengthen your muscles and shape your body, it also helps to increase your resting metabolism. This means that even when you are at home relaxing, your body is burning extra calories for you. Although you won't be able to shed fat from your abdominals directly with strength training, targeting them with strength training will help to shape and strengthen the muscles. Try exercises like the Russian twist or a weighted crunch to help you develop your core muscles so that when you do lose those inches of fat at your waist, your shape will be more defined. Circuit training is a combination of cardio exercises and strength-training exercises to provide a high-intensity workout. A series of exercises are performed one after another with minimal rest in between, keeping your heart rate up and the calories burning. By combining cardio and strength training into one workout like circuit training does, you are not only improving your cardiovascular health but also getting all of the strength-training benefits. A one-hour circuit-training session can burn anywhere from 308 to 573 calories for a 150-pound person, making it an ideal choice for those looking to take inches off their waist. ACE: So You Want to Spot Reduce? Here's How. ACE: Why is the Concept of Spot Reduction Considered a Myth? CDC.gov: How Much Physical Activity Do Adults Need? If I Do Crunches Everyday Will I Slim My Tummy? Can I Lose Inches Off My Stomach in One Month?